Alpinestars' riding boots are great, everyone knows that, but most of them are nothing I would ever buy. I don't ride motocross, and I don't race. I like to keep my gear at a reasonable level, but not to the extent of paranoia. I'm not alone in this perspective, and Alpinestars' marketing folks are obviously aware of that, because they have taken their know-how and made a short boot that covers both casual and performance street riding. The S-MX 2 gets rave reviews among riders. They are very, very comfortable and permit for ample range of motion. Made for convenience, the S-MX 2 goes on with a zipper that is concealed behind a velcro flap. The molded rubber sole offers excellent wet or dry grip and won't melt against your exhaust. A rigid shank has been incorporated into the architecture of the sole to provide a strong frame and prevent unintended bending. When Alpinestars says "performance," they're not kidding around. Replaceable TPU toe-sliders protect you from abrasion during aggressive riding. Reinforced heels and shift pads on the toes will help these boots to wear well without wearing out. Now, the only sticking point on these boots is the length. 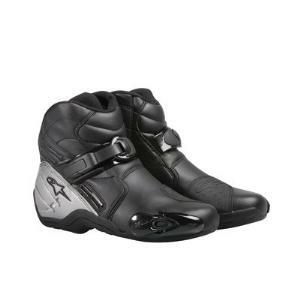 The short cut does provide for uninhibited flexibility of the ankle, but if you're riding the kind of high performance that these are designed to take, you might want more protection. Alpinestars has designed these boots to be worn with their knee and shin protectors, but at that point I would just buy taller boots. The S-MX 2 will ride and wear comfortably all day. If you want top protection for your feet but are not too worried about your shins, or if you already own shin protectors, these might be just right.